Clusters by season and locality reveal a striking epidemiological overlap between sporadic schizophrenia and multiple sclerosis (MS). As the birth excesses of those individuals who later in life develop schizophrenia mirror the seasonal distribution of Ixodid ticks, a meta analysis has been performed between all neuropsychiatric birth excesses including MS and the epidemiology of spirochaetal infectious diseases. The prevalence of MS and schizophrenic birth excesses entirely spares the tropical belt where human treponematoses are endemic, whereas in more temperate climates infection rates of Borrelia garinii in ticks collected from seabirds match the global geographic distribution of MS. If the seasonal fluctuations of Lyme borreliosis in Europe are taken into account, the birth excesses of MS and those of schizophrenia are nine months apart, reflecting the activity of Ixodes ricinus at the time of embryonic implantation and birth. In America, this nine months' shift between MS and schizophrenic births is also reflected by the periodicity of Borrelia burgdorferi transmitting Ixodes pacificus ticks along the West Coast and the periodicity of Ixodes scapularis along the East Coast. With respect to Ixodid tick activity, amongst the neuropsychiatric birth excesses only amyotrophic lateral sclerosis (ALS) shows a similar seasonal trend. It cannot be excluded at present that maternal infection by Borrelia burgdorferi poses a risk to the unborn. The seasonal and geographical overlap between schizophrenia, MS and neuroborreliosis rather emphasises a causal relation that derives from exposure to a flagellar virulence factor at conception and delivery. It is hoped that the pathogenic correlation of spirochaetal virulence to temperature and heat shock proteins (HSP) might encourage a new direction of research in molecular epidemiology. Schizophrenia and multiple sclerosis are distinct neuropsychiatric disorders of the central nervous system (CNS). Schizophrenia is characterised by disturbances in multiple domains of brain functioning, few in vivo or postmortem studies of which find evidence for a particular structural alteration . MS typically manifests as acute focal inflammatory demyelination and axonal loss involving the immune system and culminating in the chronic multifocal sclerotic plaques from which the disease gets its name [2–4]. MS and schizophrenia, nonetheless, exhibit a striking epidemiological overlap . Prevailing in the colder parts of the world and affecting mainly young adults in their most productive years, both run an irregular, chronic course. Apart from acute infections , no other disease exhibits an equally marked epidemiological cluster by season and locality, nurturing the hope that solutions might ultimately be attainable . Geographical correlations between MS and schizophrenia prevalence rates (PRs) have been reported worldwide [5, 7–9]. In the north of the USA, the states with the highest rates of schizophrenia score significantly higher rates of MS than the states with the lowest schizophrenia rates in the south . Findings that immigrants from tropical low-risk areas are more likely to contract schizophrenia or MS than those who stay behind have been widely replicated and are now considered strong epidemiological risk factors (for review see [10–12]). Migration away from the hot spots reduces the probability of developing MS if the move takes place before adolescence. Regardless of the direction of the move, however, MS death rates for migrants born in one risk area and dying in another are intermediate between those of their birthplace and their final residence. These biological gradients suggest a common environmental component that could be influenced. If caused by an infectious agent  as presupposed by Marie in 1884 , what kind of transmission or virulence would lie at its root? The earliest lesion seen in MS is a focal infiltration of lymphocytes around small blood vessels in the brain and spinal cord. This implies that inflammatory cells are reacting against an antigen located in the central nervous system (CNS) to which they have become sensitised. In MS patients, the intrathecal synthesis of immunoglobulins, the appearance of immune complexes and change in the balance of T cell populations all indicate immune activity in tissues that are normally quiet (for review see [2, 3]). The responsible antigen could be CNS tissue ('self'), in which case we are dealing with an autoimmune disease. Alternatively, it could be of microbial ('foreign') origin, or both. Analogous to streptococcal infection in relation to rheumatic fever, the environmental factor in MS may be accommodated by arguing that exposure to an infection elicits upon re-exposure an abnormal immune response against a similar antigen in the CNS. From this epidemiological point of view, we are best advised to search for positive and negative correlation. For general immunity acquired against endemic infection is supposed to increase the resistance against MS in developing countries . In the interior of New Guinea, in fact, where neither MS  nor schizophrenia  nor Lyme borreliosis  appears to be prevalent, the inhabitants exhibit antibodies possibly induced by endemic treponemes that cross-react with Borrelia burgdorferi antigens . Since the beginning of the last century it was suggested that MS and neurosyphilis caused by the spirochaete Treponema pallidum  had similar clinical and histological characteristics. Extremely difficult to find, as in tabes dorsalis , neuropathologists documented the presence of spirochaetal structures in MS plaques suggesting that the patients were infected with a spirochaete [19, 20], most likely B. burgdorferi . Congenital infection by B. burgdorferi resembles congenital syphilis as well. Like in humans , however, chronic prenatal infections by B. burgdorferi are rare in mice, and acute prenatal infection of the unborn is restricted to a narrow time window of transplacental transmission . Henceforth the birth excess of those individuals who later in life develop sporadic schizophrenia mirrors the seasonal distribution of Ixodes ticks and Borrelia burgdorferi at the time of conception . If in analogy to chronic hepatitis B infection at birth , MS were induced  or exacerbated  by exposure to B. burgdorferi antigens during delivery, we would expect a direct seasonal match between MS birth excesses and Ixodid tick activity worldwide. Contrasting with the possible deleterious mutagenic effect of B. burgdorferi at conception , a time difference of nine months is expected between MS births and the schizophrenic insult to the implanting embryo. Should general immunity acquired against treponemes  increase resistance against Borrelia and MS, we would furthermore expect a positive geographic correlation of MS to neuroborreliosis as well as a negative correlation of MS to endemic treponematoses. Otherwise, the present hypothesis of B. burgdorferi as a possible major aetiologic factor for both congenital sporadic schizophrenia and MS would be falsified. The different prevalence rates of MS as recently reviewed  were compared to the global distribution of endemic treponematoses  and to all significant schizophrenic birth-excess rates  worldwide. For statistical reasons, only publications encompassing more than 3000 cases of significant schizophrenic birth excesses compared to the normal population have been considered , including two studies from Denmark and Australia showing both one significant and one non-significant result each. 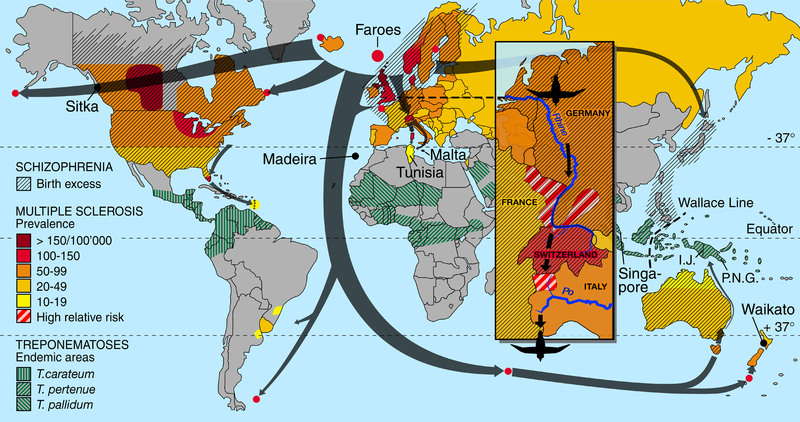 In a second step of the investigation, the routes of Borrelia carrying migratory birds were considered for the following reason. The schizophrenic birth excesses are limited to exactly those regions that are endemic for B. burgdorferi transmitting Ixodes tick vectors . This geographical overlap, however, is less than perfect with respect to MS, particularly in southern latitudes, and the use of artificial country boundaries is of doubtful biological value, unless they are given by naturally defined geographical areas . As the rule of MS varying with latitude is violated in central Europe including Switzerland and its neighbouring countries, areas of high relative risk were put under closer scrutiny. MS hot spots in central Europe, in fact, harbour the few remaining nesting sites of the classical passerine bird, the white stork (Ciconia ciconia), and migratory seabirds following the rivers and islands spread Ixodes ticks and Borrelia garinii (a subspecies of Borrelia burgdorferi sensu lato) worldwide  (see Figure 1). From the comprehensive literature, the seasonal periodicity of Ixodid tick activity was then used in this meta analysis and plotted against numerical data encompassing all neuropsychiatric birth excesses  of the respective macroclimatic regions including MS (Figure 2). Geographical correlation of schizophrenic birth excesses and MS prevalence to spirochaetal diseases The gradient of MS prevalence  and schizophrenic birth excesses [16, 28] entirely spares the tropical belt where human treponematoses prevail . In subtropical zones between the 37° latitudes, there exists an additional climatic effect diminishing the prevalence rates of MS worldwide. This 'rule' of variation by latitude, however, is violated in Europe, Australia and New Zealand where circumpolar migratory seabirds reportedly introduce Ixodes uriae and Borrelia garinii  from the MS hot spots in the north [12, 15]. The arrows represent the migratory routes and distribution of seabirds if a number of species such as puffins (shearwaters), seagulls and terns are taken together [56–59]. The sites from where samples in search for Borrelia garinii were collected by Olsen et al. are marked with a red dot and include the Egg and St. Lazaria Islands (Alaska), Gannet Island in Newfoundland (Canada), Iceland, the Falklands, the Faroes, Bonden Island (Sweden), Cape Sizun (France), the Crozet Islands (South Africa), and Campbell Island (New Zealand). There are just a few subtropical areas including Madeira, Morocco and Tunisia from where the presence of B. burgdorferi s.l. has been documented. Two protective factors could thus explain the rarity of MS and schizophrenic birth excesses in developing countries: acquired immunologic resistance against spirochaetes in the tropics, and higher temperature being inversely related to tick-borne spirochaetal transmission in subtropical zones. Seasonal correlation of neuropsychiatric birth excesses to Ixodes ticks and Lyme borreliosis in America and Europe In America, the seasonal distribution of schizophrenic  and MS  birth excesses exactly mirrors the periodicity of Ixodes scapularis along the East Coast  and that of Ixodes pacificus along the West Coast . Curiously enough, in many studies conducted in the USA, the month of June is often the month with the lowest risk of developing schizophrenia (Jean-Paul Selten, personal communication, 2002). This schizophrenic birth deficit corresponds to the tick activity, which is at its lowest nine months earlier in September, being particularly striking, if both species Ixodes scapularis and Ixodes pacificus are taken together. If stochastic annual fluctuations are taken into consideration [43, 44], the spring (a) population of Ixodes ricinus  likewise mirrors the significant birth excess rates of schizophrenia , ALS  and MS  in Europe. The nine months' shift between sporadic schizophrenia on the one hand and ALS and MS on the other reflects the possible transplacental transmission of Borrelia burgdorferi  at the time of conception  and delivery . The geographical gradient of MS (Figure 1), which sharply declines at the 37° latitude [12, 15], entirely spares the tropical belt where human treponematoses caused by T. carateum, T. pertenue, and endemic T. pallidum prevail . This negative correlation between areas of endemic treponematoses on the one hand and MS as well as schizophrenic birth excesses on the other is striking. With the notable exception of Florida, Australia and Tunisia (see Figure 1), subtropical areas exhibit neither a significant schizophrenic birth excess nor a prevalence rate (PR) of MS higher than 5/100'000 . In central Europe, the highest relative risks for MS can be found along the breeding sites of migratory birds. These hot spots are located along the north-south axis of the Upper Rhine plain and its tributaries, the Bas Rhin, Haut Rhin, Moselle regions , around Basel , in the Swabian Alps , Sardinia, as well as the Aosta Valley , the only place in Italy where the white stork (Ciconia ciconia) still nests (see insert in Figure 1). Tunisia, which is reached by passerine European birds carrying Ixodes ticks and B. garinii , scores the highest rate of MS in Africa . Malta, by contrast (see Figure 1), which compared to Sicily is relatively free of MS [11, 15], hosts a number of endemic lizards, and ticks lose their infectious potential for humans when feeding on these reptiles. This so-called zooprophylactic effect also applies to the low-risk areas of MS and sporadic schizophrenia  in the United States, where south of the 37° latitude infections by B. burgdorferi are poorly maintained in lizards . Although of low prevalence, MS exists in South East Asia: in Japan and Taiwan [15, 36] down to the Philippines , where the Wallace Line (see Figure 1) limits the southward spread of B. burgdorferi harbouring Ixodid ticks into Austronesia . In Irian Jaya (I.J.) and P.N.G. (see Figure 1), from where neither the presence of Lyme disease nor MS has been reported, schizophrenia is non-existent apart from the south-west coast which is sporadically reached by migratory birds and ticks . In the southern hemisphere, MS and schizophrenic birth excesses  are, compared to the northern hemisphere, less significant. From the area of Singapore, which is non-endemic for Ixodes ticks and B. burgdorferi but endemic for treponematoses (see Figure 1), a schizophrenic birth excess is significantly absent. This trend parallels the scarcity of MS and relatively recent upsurge of schizophrenic birth excesses in Japan, where B. garinii harbouring ticks have been sporadically introduced by migratory birds from North East Asia (for discussion see ). Southern Australia and New Zealand, by contrast, which can be reached by polar seabirds carrying Ixodes uriae and B. garinii via the Antarctic , score relatively high rates of schizophrenia  and MS . The infection rates of B. garinii in I. uriae ticks  reflect not only the global distribution of MS, but also its worldwide gradient. The highest number of spirochaetes detected by microscopy were collected from seabirds in Iceland, Alaska and the Faroes (see Figure 1) all areas from where epidemics as well as very high rates of MS have been published [12, 41]. Ticks from Sweden yielded lower spirochaetal counts and on an island south of New Zealand, where MS is reportedly less prevalent compared to the northern hemisphere , the number of detected spirochaetes was the lowest . Ticks from Cape Sizun (France) yielded negative results, and, unfortunately, the ticks collected on the Falklands and the Crozet Islands (South Africa) were dead and thus not examined by microscopy. Regardless of the geographical origin, B. garinii DNA was isolated and detected by PCR in all ticks and cultured spirochaetes, with two notable exceptions. The samples from the Atlantic coast of France and those from the Falklands - which do not appear as particularly hot spots for MS [31, 42] - were all negative . If the stochastic annual fluctuations of schizophrenic births  and Lyme disease  are taken into account, the birth excesses of MS in Denmark  and those of schizophrenia in Finland  are exactly nine months apart. In northern Europe, the seasonal patterns thereby reflect the activity of endemic Ixodes ricinus [44, 46] at the time of conception and parturition respectively. Likewise, there exists a nine months' shift between MS birth excesses in Canada near Vancouver [30, 47] and schizophrenic births in the USA . The respective seasonal distribution exactly mirrors the periodicity of the adult and juvenile stages of B. burgdorferi transmitting I. pacificus ticks along the West Coast  and that of I. scapularis ticks along the East Coast (see ). Amongst all other neuropsychiatric disorders, only amyotrophic lateral sclerosis (ALS)  shows a similar seasonal trend [30, 51] with respect to Ixodes tick activity in Europe  (see Figure 2). The uneven distribution of MS has been noted in the medical literature for well over 100 years . Although difficult to assess reliably from one geographical area to another , it has also become clear that the frequency of the disease varies significantly not only in different parts of the world, but even within countries. The first epidemiological study by Davenport (1922) pointed out that MS affected persons of Scandinavian and Finnish descent more than other ethnic groups, a conclusion confirmed by Bailey's study of American troops in World War I. Later propositions that MS, as well as ALS [53, 54], relate to latitude and cold climate unleashed a controversy over nature versus nurture that continues to this day (for review see [11, 12]). Since current opinion favours a genetic/immune process for MS, as well as ALS, the possibility of spirochaetal infection has not been considered in depth. The similar global distribution of seabird-borne ticks and Scandinavians and their descendants, who appear to be at high genetic risk for MS , is not entirely coincidental. One Viking legend claims that the Faroes were discovered by following marine birds . While seabirds themselves often follow ships and eat fish offal floating on the water suface , the scandinavians were apparently led by such birds to new fishing grounds . Little more than 300 of the approximately 9000 known bird species are seabirds. Yet, these birds occur throughout the world and are the only group of birds to have successfully colonised Antarctica, the most inhospitable continent. Although some seabirds breed and winter within comparatively small areas, many are champions in long distance migration, travelling thousands of kilometres on journeys from the far north of the northern hemisphere to the limits of the Antarctic pack ice in the southern hemisphere [57, 58]. The seabirds, which spend most of their lives far out to sea, must procreate on land. To avoid predators, they often breed on isolated islands and peninsulas leading to the aggregation of hundreds of thousands, and sometimes millions of pairs during the breeding season. The presence of such huge numbers not only depends on the abundance of food in the surrounding seas, the crowding habit also makes the birds and their offspring vulnerable to the seabird associated Ixodes uriae tick. No wonder, infestation by I. uriae has been reported from more than 50 species of seabirds in both hemispheres (see ). Because seabirds take their food from shallow waters, many coastlines and islands are prime sites for breeding colonies [57, 58], Borrelia transmitting I. uriae , and MS . On the Faroe Islands (see Figure 1), where Ixodes uriae reportedly transmits Borrelia from seabirds to human bird catchers , the MS scenario apparently unfolded after an annulled ban on fowling seabirds during a food shortage in World War II . Whatever speculation be more plausible - transmission by ticks  or soldiers [12, 14] - the prevalence of MS subsequently rose from apparently zero to 21 cases heralding the first of four successive epidemics . On Iceland and elsewhere such epidemics have been attributed to increased awareness, changes in ascertainment or better diagnosis of MS, particularly of more benign cases in the post-war era . However, a common setting for MS 'epidemics' is proximity to coastal areas or islands where seabirds nest . From western Alaska both the presence of Ixodes uriae and B. garinii have been reported , and in Sitka being surrounded by three major seabird colonies in south-eastern Alaska (see Figure 1) MS was unknown until its first outbreak occurred in 1965 . Genetic [60, 61] as well as epidemiological studies, in which biological plausibility had been ignored , often provided contradictory information. One of the significant risk factors mentioned in a study from Key West (Florida), for instance , were visits to a local military base, a finding that the authors noted as a point of similarity to the military occupation and its reported effect on the Faroe Islanders . In Malta, however, which was occupied by British troops from 1802 to 1978, the low PR of MS doubled from 1978 to 1988 (from 4.2 to 8.4), after the British left . In contrast to Sicily with a relatively high MS PR of 61, however, the population of Malta (see Figure 1) still enjoys significant protection from MS that cannot be convincingly explained by geneticists either. It is noteworthy that since the Arabs were driven out by a band of Scandinavian adventurers, who had established a kingdom in southern Italy, Malta became a Norman appendage of Sicily for almost half a millennium. Yet, in addition to Scandinavian genes , Malta also hosts four endemic races of lizards (Podarcis filfolensis), and ticks lose their infectious potential for human beings when feeding on these reptiles. This so-called zooprophylactic effect also applies to the USA , where south of the 37° latitude (see Figure 1) the PR of MS is significantly lower [12, 15]. The only notable exception is Florida , where migratory seabirds stop over for nesting . Otherwise, infections by B. burgdorferi are poorly maintained by lizards in the south of the United States . While seabirds are not common in states such as North Dakota, Montana, Idaho and Colorado where MS is high, the inland spread of Ixodes ticks and Lyme disease by land birds is well documented in the United States . At the expense of a persistent vulnerability to lizards, the tick-borne pathogen has proven successful in spreading neuroborreliosis including MS via sub-polar routes  across the globe (see Figure 1). European strains of B. garinii infections have been documented in human cases from the USA  and Australia . The case of Lyme borreliosis in the southern hemisphere has been confirmed by culture and serotyping . Being of European origin, this type of B. burgdorferi s.l. was most probably introduced into Australia by a migratory seabird. Not surprisingly after all, southern Australia and New Zealand, which polar seabirds carrying Ixodes uriae  reach via the Antarctic, score relatively high risks of MS. Even the highest PR in these communities, largely originating from the United Kingdom, is not much more than half the rate in most parts of the British Isles . This difference in relative risk is hard to understand from a purely genetic point of view. But there isn't much room for 'pure' environmentalists either, as Waikato in New Zealand, where the main step in MS morbidity occurs across the North Island, scores a lower rate than places in Australia on a comparable southerly latitude [2, 15]. For migratory seabirds introducing Ixodes uriae from the northern hemisphere  reach New Zealand later than Australia (see Figure 1). In the northern and southern hemispheres, several species are responsible for this transhemispheric exchange. Great puffins or Manx shearwaters (Puffini puffini), for example, move around the world in giant loops. They are abundant off the European continental shelf in July and August, when they are heading southeast. Between September and December, the puffins spend their time mainly along the American coast form Rio de Janeiro in the north to the Rio de la Plata in the south. Along these coasts, the nutrient-rich water advances during this period with the Falkland Current producing upwellings on the water surface rich in fish. By March and April the birds leave their breeding colonies on the Falklands and other islands in the South Atlantic heading northwest across the equator to the rich fishing waters off Newfoundland. Then they gradually move back across the North Atlantic, where they are often seen around Scotland, Ireland and the Faroes, where the traditional puffin-hunting season starts in the end of July [57–59]. In the southern oceans, where the winds blow almost continuously eastwards in the roaring forties and furious fifties, a ringed great puffin has even been found in south Australia. The distribution of short-tailed puffins, or short tailed shearwaters (Puffini tenuirostri), is limited to this part of southern hemisphere, where the birds breed on islands off the coast of New Zealand and Australia. In Tasmania, as in the Faroes, their so-called mutton-bird chicks are regularly fowled . Among the most successful and widespread marine birds are the seagulls. There are some 45 species, which occur in both hemispheres. Colonies may be tens of thousands strong, particularly if there is a major source of food thereby. Outside the breeding season most gulls, such as the black headed gull (Larus ridibundus), undertake migratory movements, sometimes wintering well out to sea. They move parallel to latitude to avoid cold weather, or they simply disperse over comparatively short distances along rivers [58, 65] (see Figure 1). Along the tributaries of the upper Rhine  they thus reach the foot of the Swiss Alps where B. garinii has become highly endemic among other terrestrial passarine birds. These, in turn, may spread borreliosis to other hosts  by regularly migrating to northern  and southern Europe either along the valley of the upper Rhone or directly via Alpine passes (personal communication 2002, Christian Marti, Swiss Ornithological Institute, Sempach). Extending a previous report from the United States, Templer and colleagues found a high geographical correlation between MS and schizophrenia in Italy . As a correct temporal relation between cause and effect is essential in epidemiology , correlated birth patterns of MS and schizophrenia were then studied. In Denmark, a significant birth excess of MS was disclosed in spring-early summer, but the data on schizophrenia were insignificant compared to the general population . This negative finding, which can be explained by stochastic fluctuations (for discussion see ), was unfortunate since accumulating evidence from most other studies  did yield significant schizophrenic birth excesses in winter and spring. In Sicily, interestingly enough, MS birth excesses being shifted towards the end of the year  show a seasonal trend reminiscent of the seasonal Ixodes tick activity in neighbouring North Africa . And in Tunisia, where Ixodes ticks harbour B. garinii and B. lusitaniae  - species known to be scattered geographically by birds from Europe - MS scores the highest rates in Africa . MS has never been reported in ethnically pure Eskimos, Inuit, Lapps, Amerindians, Australian aborigines, New Zealand Maoris or Pacific Islanders . Yet, most of these natives either live near the polar circle, where tick activity abates due to low ambient temperature, or they live in tropical climates where Treponema  but not Borrelia spirochaetes prevail (see Figure 1). The most convincing evidence for the importance of genetic or acquired resistance is the extreme rarity of MS in native Africans. In the Cape Province of South Africa, the disease is recognised among the so-called coloured, but neurologists in Johannesburg are extremely reluctant to make the diagnosis in a black person . Hawkes  maintains that in developing countries a general immunity is acquired against infection, which might also spread "in utero or during parturition" and possibly increases the resistance against MS and sexually transmitted disease. Until the early nineties, I was working as a medical delegate in southern Africa and cannot share Hawkes's opinion on the isolation of 'black' Africans from 'white' sexual permissiveness. Venereal diseases including syphilis were highly prevalent among natives of South Africa, Angola and Mozambique, and in that part of the world it is the incidence of AIDS, but not MS, which has substantially risen. The "infrequency of MS and AIDS in the same patient"  rather favours the hypothesis of a hyperergic immune process [2, 3] which is suppressed in a state of immunodeficiency such as AIDS. Whilst it is always more prudent to await the discovery of new facts , long-held  hypotheses  often raise testable questions if taken together and dissected with Occam's razor. The MS gradient, which sharply declines at the 37° latitude, suggests a temperature-related environmental factor that cannot be ignored (see Figure 1). The geographical distribution of endemic treponematoses, by contrast, as well as blood group 0 antigens which appear to convey resistance against Treponema pallidum , are restricted to exactly those parts of the tropics that are free of MS. This contrast is of evolutionary importance with regard to the adaptation of intracellular pathogenic spirochaetes. Like the AB0 blood group system , the evolutionary conserved heat shock proteins (HSPs) do not only induce heat resistance, but also activate host immune defences that are detrimental for pathogens (see for example [72–78]). Molecular evidence reveals that Treponema pallidum - the agent of syphilis being an exclusively human pathogen and B. burgdorferi s. l. - the human and animal pathogens of Lyme borreliosis - have circumvented this immunological impasse differently. Whilst in the course of evolution Treponema pallidum, being directly transmissible from human to human, lost its capacity to induce HSPs , heat resistance  and thus vector-borne transmission, B. garinii has adapted to a broad temperature range . To survive heat shocks during vector-borne transmission, the gram-negative Borrelia pathogen therefore expresses HSP-60 and HSP-70 , which are members of the evolutionary conserved HSP family. This form of vector adaptation is essential during rapid changes in temperature, in particular when transmitted from ticks to their warm-blooded hosts  including birds. In the absence of other vertebrate hosts on certain islands, the presence of Borrelia in I. uriae ticks suggests seabirds to be competent reservoirs and amplifying hosts. In contrast to B. burgdorferi sensu stricto being cleared from the respective Ixodes vectors at 37°C , a temperature of 38°C is permissive for the transmission of B. garinii . The relatively low body temperature of 38°C in marine birds, compared to the body temperature of terrestrial birds of 40°C, explains why these B. burgdorferi s.l. spirochaetes are particularly adapted to seabirds . But the pathogen's success of transmission also depends on its ability to replicate and survive within a host for long periods. One option is to remain latent inside the long-lived cells of the CNS whose temperature is about 38° in humans. This coincidence elucidates the characteristic spread and neurotropism of B. garinii, which is frequently associated with neurological manifestations . In vitro evidence suggests early invasion of the CNS by B. burgdorferi sensu lato by adherence of this organism to sphingolipids . Functionally linked to a flagellar protein, HSP-60 is thereby involved in binding to the neural cell surface for intrusion into the CNS [87, 88]. As HSP-60 is a major immunodominant antigen of B. burgdorferi , it comes as no surprise that antibodies to HSP-60 were also detected in the synovial fluid of Lyme arthritis patients . Although still a controversial issue [91–93], molecular mimicry of flagellar epitopes, which are highly antigenic , may misdirect antibodies against host tissues as well [95, 96]. For pathogens must avoid being destroyed by the immune response while maintaining access to a new host, and protracted antigenic exposure destabilises the immune system. Epidemiology cannot replace molecular, experimental and pathological investigation including case reports, despite the fact that these are often dismissed as 'anecdotal'. Is it possible that the Borrelia flagellar basal rod protein (fbrp), implicated in the pathogenesis of sporadic schizophrenia at conception [16, 97, 98], also plays a pathogenic role in MS following transmission at birth? As fbrp shares an epitope with the human interleukin-1 receptor antagonist IL-1ra (see Table 1 an ), it is plausible to assume that such amino acid homology between B. burgdorferi and its human host potentially induces and misdirects anti-IL-1ra antibodies. Might re-exposure to the same  or similar antigens [101, 102] subsequently trigger MS later in life? Conversely, may cross-reacting antibodies acquired against Treponema spirochaetes protect migrants from tropical countries against infection by Borrelia spirochaetes and thus antigenic exposure to fbrp? The occurrence of homologies between B. burgdorferi flagellae and host molecules has been amply demonstrated [95, 96]. This phenomenon, termed molecular mimicry, explains why an antibody generated against a particular epitope of an infectious pathogen may become an autoantibody, reacting with a homologous epitope in the host and bringing about structural dysfunction or tissue damage. The autoimmune response will continue to attack the host even after clearance of the pathogen from the infected organism. However, autoimmunity by molecular mimicry will only occur if epitopes of the pathogen and of the host are similar enough to allow immunological cross reaction, yet different enough to break immunological tolerance . The homology was assessed by protein BLAST using the search program at OMIM  for short, nearly exact matches. Length = 153, Score = 27.8 bits (58), Expect = 15, Identities = 10/18 (55%), Positives = 15/18 (82%), Gaps = 1/18 (5%). Accession numbers: B. burgdorferi fbrp:1448943; Human interleukin-1 receptor antagonist: 999512. Not only tropical spastic paraplegia  mimics the clinical pattern of MS. In several respects, MS is more reminiscent of neuroborreliosis [102–105], which in its chronic form is supposed to be an autoimmune disease triggered by these spirochaetes [95, 105]. MS plaque-derived DNA  shows an abundance of transcripts for several heat shock proteins (HSPs), including HSP-70 and anti-HSP-70 antibodies, but apparently not for interleukin-1 (IL-1β), the underlying pro-inflammatory cytokine (see also [107–110]). This contrasts with other common gram-negative infection, in which HSP-70 induction correlates with elevated levels of IL-1β transcripts . A putative anti-IL-1ra immune response against IL-1 receptor antagonists (IL-1ra) might therefore explain this specific post-transcriptional dysbalance at the level of the IL-1 receptor unleashing a cascade of ruinous inflammatory cytokines. There are three arguments in support of such a role: reduced genetic expression of IL-1ra versus IL-1β has been associated with disease severity in MS . IL-1ra can be increased by interferon beta , the first neuromodulatory drug approved for the treatment of MS . Conversely, lower IL-1ra versus higher IL-1 activity enhances inflammation, whereas a dysbalance in favour of IL-1ra versus IL-1 reportedly mitigates this reaction in MS, experimental allergic encephalomyelitis (EAE) and B. burgdorferi induced Lyme disease [114, 115]. When in 1925 Adams et al. inoculated rhesus monkeys with material from MS plaques, spirochaetes emerged in their ventricular fluid after several months. More recently, cystic structures originating from B. burgdorferi were found in eight of ten MS patients by immunofluorescence and in all the MS patients by use of transmission electron microscopy and staining after culture . The patients originated from a well-defined coastal area of southern Norway, where Lyme borreliosis [117, 118] as well as MS [12, 15] is highly endemic. No such cysts could be observed in the five controls with either method, but the investigators noted a similarity between those found in the MS patients and the cystic forms characteristic of spirochaetes and chronic B. burgdorferi infection. More importantly, the cysts of the MS patients exhibited positive reactions to antispirochaetal antiserum . In analogy to the induction of heptocellular carcinomas upon chronic hepatitis B infection acquired during delivery  and in analogy to lymphomas of the skin induced by chronic B. burgdorferi s.l. infection [117, 118], we would expect an association of MS and ALS with neoplastic transformations of the lymphatic system. A significant correlation between non-Hodgkin's lymphomas and MS appears to exist , and in a review of neurolymphomatosis a case was documented with schizophrenia and anterior horn involvement, a hallmark of ALS . As the cause could not be identified, a virally mediated autoimmune pathogenesis was proposed. Whatever the pathogenic link between schizophrenia and MS - an infection followed by an altered immunologic response  or a continuum of chronic inflammatory CNS disorders including neuroborreliosis, syphilis, or viral encephalitis  - we would expect an analogous link between schizophrenia and ALS in terms of latitude [53, 54], season (see Figure 2) and causality . Among relatives of Ashkenazi immigrants to metropolitan New York suffering from schizophrenia , the prevalence of ALS compared to the expected population rate in the USA, where B. garinii is non-endemic, was more than a hundred times higher. Not surprisingly after all, the countries of ancestral origin included eastern Europe and Russia  areas where B. garinii is endemic [117, 118]. Up to ten percent of patients initially diagnosed as having ALS are re-diagnosed as having a disease other than ALS . Although it seems unlikely that infection by B. burgdorferi is a frequent cause of ALS , a discrete subset of patients living in hyperendemic areas appears to be significantly more likely to have immunologic evidence of exposure to B. burgdorferi than do controls, and some of these patients do appear to improve if treated with antibiotics . Is the epidemiological association biologically plausible? Although the nosological criteria for MS and schizophrenia have high diagnostic reliability, affected individuals may differ substantially in the specific profile of signs and symptoms, as well as in the severity and course of their illness. What we recognise clinically as 'schizophrenia' or 'MS', is likely to encompass a complex set of disorders. A major task of future studies will thus be to resolve the question of heterogeneity in MS  as well as its aetiologic overlap with other disease processes. Seroepidemiological studies relating B. burgdorferi to MS [126–128] and ALS [125, 129, 130] have produced conflicting results. However, when entering the CNS, microorganisms can undergo antigenic  and extensive metabolic changes, which prevent them from being recognised by the current serologic test methods. These changes protect B. burgdorferi from the host's immune system and reduce the effect of antibiotics [21, 132]. Although infections all induce specific antibodies and cell-mediated immunity, microbial virulence factors have not often been individually defined or even identified . There are hundreds or thousands of antigens, and immune responses develop to many of these. Resistance to infection, however, depends on the reaction against a few antigens on the surface of the microorganism . The flagellar basal rod protein of B. burgdorferi (fbrp) responsible for locomotion, adherence and host cell penetration is part of such a virulence factor. Influencing parasite-host interaction, gram-negative bacteria use this type of basal ring assembly to secrete and translocate flagellar and virulence proteins directly into the cytoplasm of their host cell . While temperature is a key environmental cue for the switch between motility and plasmid-encoded gene expression of virulence, stress-related degradation of the secreted substrates is accordingly prevented by the chaperonising function of HSPs . The coincidence of both genetic and antigenic exposure to Borrelia fbrp is therefore not casual, but a highly specific pathogenic event. Mutations by homologous recombination affecting the implanting blastocyst at conception  and chronic infection afflicting the immunologically immature newborn upon delivery , it is conjectured, will subsequently trigger sporadic congenital schizophrenia and MS respectively. That maternal infection by B. burgdorferi s. l. poses a risk to the neonate cannot be excluded. The global epidemiological clustering by season and locality rather emphasises a causal relation between MS and sporadic schizophrenia, which derives from both genetic and antigenic exposure to a spirochaetal virulence factor at conception and birth. The identification of flagellar Borrelia DNA on human CB1 and its relation to IL-1 receptor dysfunction reminds us of Virchow's postulate in 1849: "In searching for pathological systems one must clearly not construct nosological but only etiological ones" . It is hoped that this correlation might encourage a new direction of neuropsychiatric research in molecular epidemiology. To RP re-diagnosed as having a birth defect, MS, ALS, and ultimately atypical neuroborreliosis many thanks for her trust and patience.